Based on my previous success with visual entrainment, I'm moving forward with my plans on making a brain-computer interface (BCI) using my blinky lights. To really kick this project into high gear, though, I need a good goal -- I need something that would be really fun to control with my brain. Luckily, my OpenBCI friend Conor, found these cool remote-controlled 6-legged robots that can walk around a fire a little gun. Bingo! 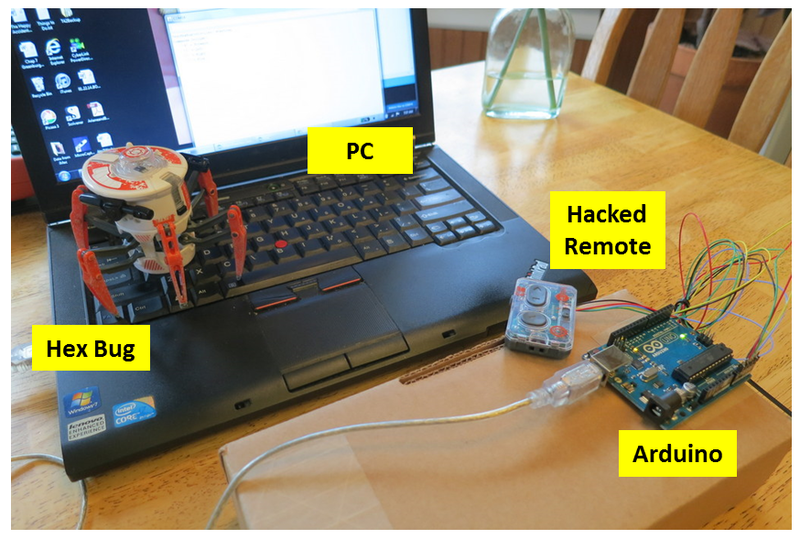 As you can see below, today's post shows how to hack the robot's remote to make it controllable from an Arduino. Once it is controllable from an Arduino, it's only one more step until it's controllable from my brain! The Hex Bug Battle Spider: The remote-controlled robot that Conor found is a Hex Bug Battle Spider. They are available in two colors and you can have them do battle. Hex Bug makes smaller and cheaper versions of this robot, but I believe that only the Battle Spider has the ability to do battle. I'm looking forward to facing off cerebro-a-cerebro with Conor, so I'm sticking with the Battle Spider. IR Remote Control: The Hex Bug is commanded using an infrared (IR) remote-control. It is the remote control that I will hack so that the Hex Bug can be commanded from an Arduino. As you can see in the picture below, I was so anxious to hack the remote, that I never got a picture of it while it was still in one piece...I just couldn't wait to smell the solder! Regardless, as you can see, the remote is simply a bunch of plastic pieces, a couple of coin cell batteries (not shown), and a printed circuit board (PCB). Thank You, Test Points! Flipping over the PCB, I was very pleased to see that this board has test points for everything. Oh, the joy! Because of these test points, it is much easier to probe the board with my multimeter or with an oscilloscope to figure out how this thing works. The test points also makes it much easier to attach wires to control this thing from the outside (like from my Arduino). It turns out that there is a test point for each of the four user buttons on this board. The relevant test points are shown in the picture below. These test points will be the focus of my work. with the arrows are for the user buttons. How the Buttons Work: After a bit of probing of these test points, I learned that the buttons are used like most buttons in small devices like this (see "Button" demo by the Arduino folks for more info). The buttons on this remote control are simply switches that are normally open-circuit. When you press a button, the switch becomes closed-circuit. The "low" side of each button is tied to ground. The "high" side is connected to 3.3V via a pull-up resistor (probably inside the microcontroller). The microcontroller is continually sensing the voltage on the high side of the switch. 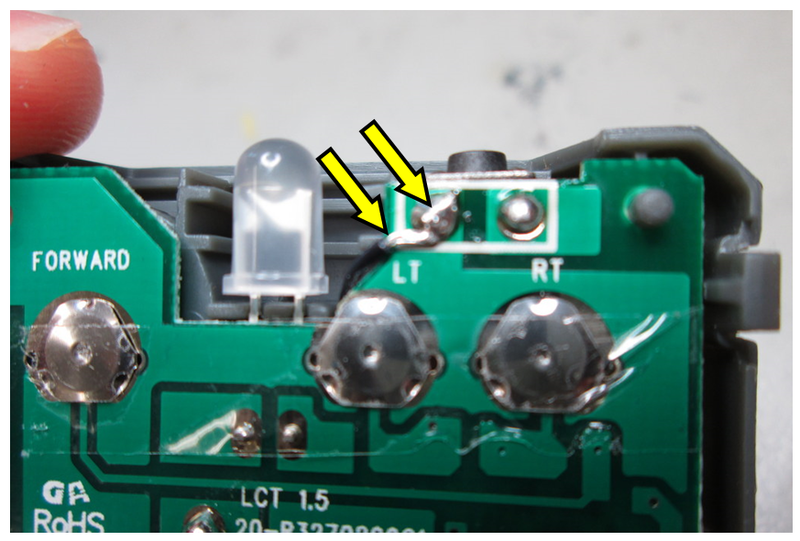 When the button is not pressed, no current flows through it nor through the pull-up resistor, so the voltage seen by the micro is high. When the button is pressed, current flows through the button, which drops the voltage seen by the micro. As a result, the micro knows that the button was pressed. Easy! Hacking Approach: Based on this discussion, it is clear that the microcontroller on the remote control knows nothing about the buttons...it only knows about the voltage being controlled by the buttons. When one of those lines goes from high to low, the microcontroller thinks that a button has been pressed. My hacking approach, therefore, is to wire the Arduino to the remote control so that the Arduino can pull the lines low for me. This requires me to attach a wire to the high side of each button and to a attach a wire to the remote control's ground. Normally, I'll keep the Arduino's pins in a high-impedance state so that no current flows. When I want it to "press" a button for me, I'll command the relevant pin to go into a low-impedance state to allow it to conduct current to ground. Electrically, this will mimic the behavior of the buttons themselves. No extra components will be necessary! Connecting Ground: OK, we're mostly done talking. Now let's start soldering. First, I connected a wire to the remote's ground. After looking around the PCB, I decided that I liked the solder that was on the low side of the "fire" button. So, as you can see below, I sneaked a black wire into that location and soldered it in place. attach to the remote control's ground. Connecting Each Button: Then, I flipped the board over and soldered a colored wire to each button's test point. All of my wires are now soldered to the test points. Snip a Pass-Through for the Wires: While it is not necessary to do this, I like the idea of re-assembling the remote so that I can use it with my fingers (as if it were not modified) or so that I can use it with the Arduino. To enable the reassembly of the remote, one simply has to cut a hole in the plastic housing to get the wires out. I used a "nibbler" tool to cut a small hole. As you can see below, it worked really well! I can get the wires out, even after I fully re-assemble the remote control. Attach a Pin Header: To ease the connection of these 5 wires to the Arduino, I decided to solder the free ends of the wires to a piece of basic pin header. With these pins, I can easily insert the five wires as a single unit into the sockets on the Arduino board. 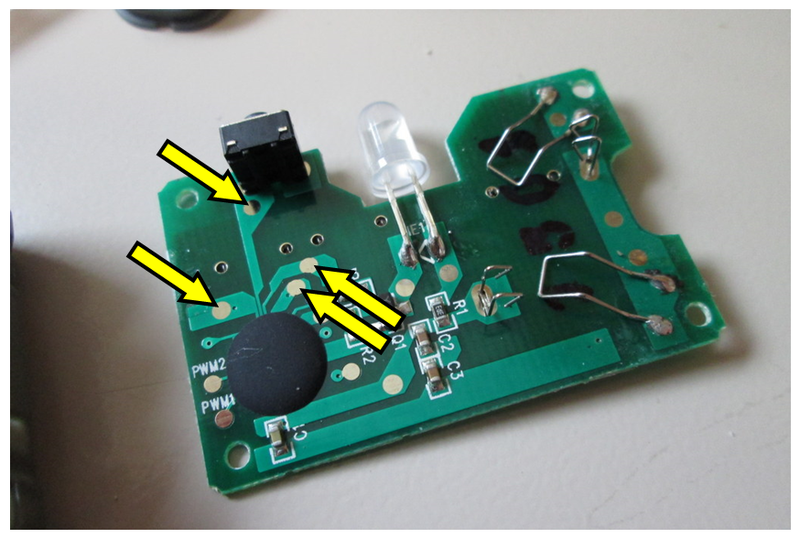 The Hacked Remote: The picture below shows the hacked remote after I reassembled it. I tested it by pressing the buttons with my fingers and the robot moved. So far, so good! My hacked remote control is now re-assembled and ready for testing. Software: If I'm going to command this robot from my Arduino, the Arduino needs software. So, I plugged in my remote to the Arduino (because the Arduino is really flexible, I used the Analog Input pins even though these signals are neither Analog nor are they Inputs...but that doesn't matter, you can use the Analog pins as Digital ins and outs, too) and then began coding. My code is available on my GitHub as "TestHexBugController". This code tells the Arduino to listen to commands coming over Serial from the PC. I assign one ke on the PC's keyboard to each of the Hex Bug's four functions: "forward", "turn left", "turn right", and "fire". When the Arduino receives one of these commands, it toggles the relevant pin to pull it LOW for 500 msec. That's all it takes! commands entered from the PC. Testing it Out: As you can see in the video at the top of this post, this setup works pretty well for controlling the Hex Bug. I can make it walk anywhere and shoot its gun on command. It's pretty fun. If I cared to, I could no script a whole series of maneuvers. If I attached a pen to the Hex Bug, maybe I could make it walk around on a big piece of paper so that it would draw out a funny picture. That could be fun. Or, I could combine it with some computer vision on my PC and have it chase my cat around. That would definitely be fun. Sadly, I don't know anything about computer vision. Brain Control: Really, though, my next step is to control this with my brain. So, I'll attach my OpenBCI shield to this same Arduino and I'll have the Arduino pipe my EEG signal to the PC. On the PC, I'll process the EEG signal and, if it detects the right brainwave signatures, I'll have the PC send robot commands back to the Arduino. The Arduino will then convey those commands to the robot via the IR remote. All of the hardware pieces are in place...now it's time to put it all together! Follow-Up: I finally did put all the pieces together. I can now control the Hex Bug with my brain waves! EEG as WAV Files, Go Spectrograms!